Multiple Macs with multiple Thunderbolt 3 ports inspired some interesting and useful Thunderbolt 3 storage solutions. In this posting we highlight some creative options from Other World Computing. 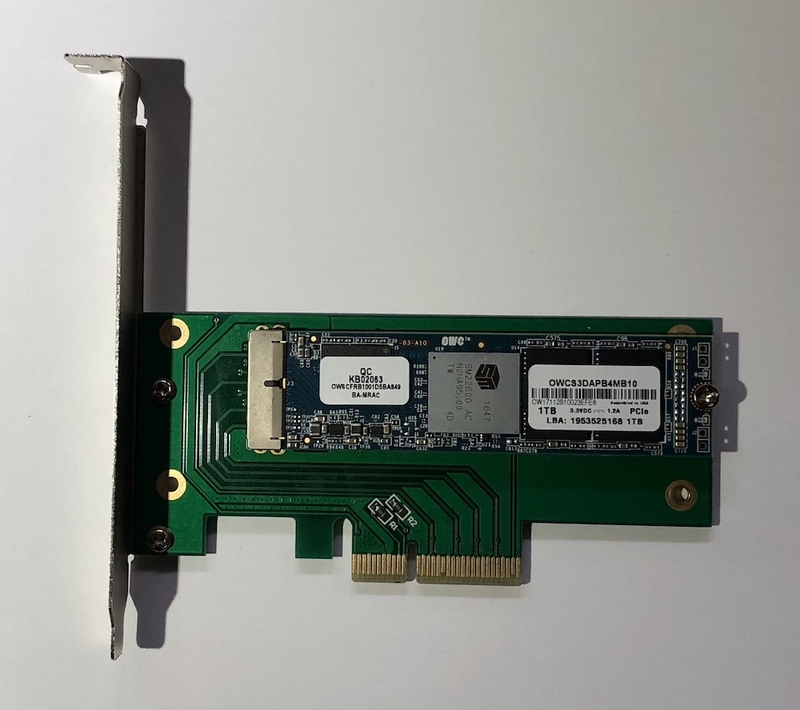 Aura Pro X > Helios 3 - OwC Aura Pro X 1TB PCIe-based flash blade with Apple proprietary connector mounted on x4 PCIe Apple blade carrier board and installed in the Mercury Helios Thunderbolt 3 PCIe expansion chassis. Other World Computing has been busy producing some useful Thunderbolt 3 storage options for the newest iMacs and MacBook Pros. We already introduced the ThunderBlade in an earlier article where we striped two of them to get up to 4400MB/s. As a RAID storage with four flash blades, it understandably requires a power brick. Fast, rugged, and available in up to 8TB total capacity, it passed our 10 minute thermal throttling test with flying colors. With speedy READ and WRITE speeds, it is a great auxiliary storage option for your iMac 5K or iMac Pro. 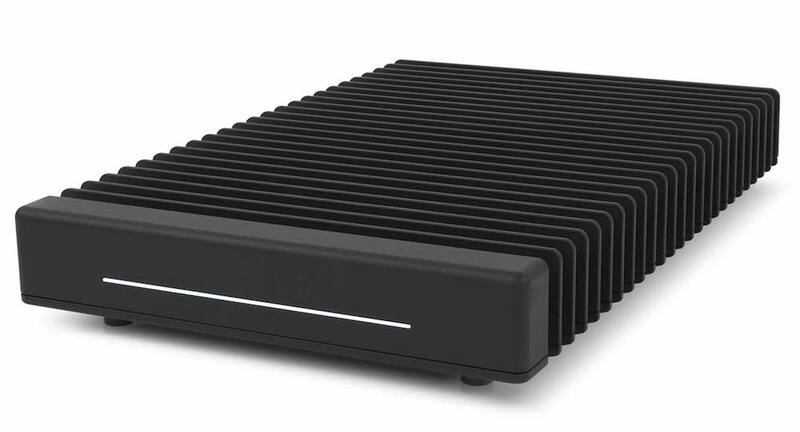 If you prefer smaller, lighter, bus-powered storage, the Envoy Pro EX (VE) is available in capacities up to 2TB. Its 2664MB/s large sequential READ speed is as good as it gets for a single Thunderbolt 3 port. The large sequential WRITE speed was slower than we hoped, but is typical of what we are seeing when Samsung 960 Pro NVME blades are used in a Thunderbolt 3 storage device. It also passed our thermal throttling test with flying colors. 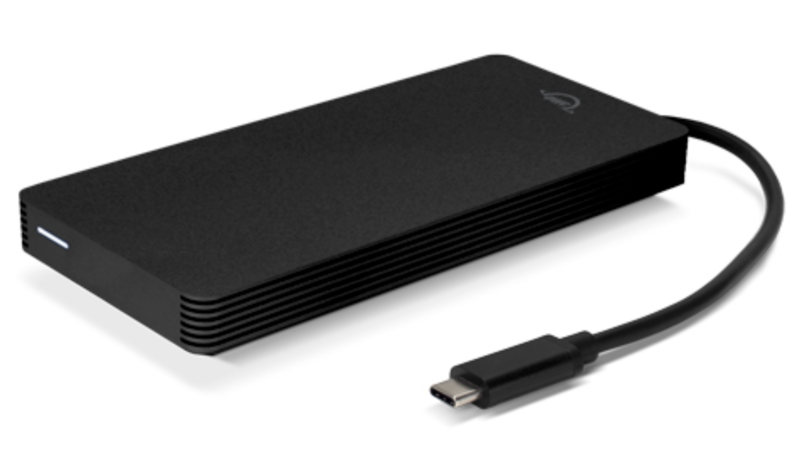 It should be considered a serious portable TB3 storage option for your MacBook Pro. The Aura Pro X Flash Blade was designed as an upgrade for your 2013 Mac Pro's storage and certain other Macs with removable flash storage modules. As you know, Apple blades do NOT have M.2 connectors. They have a proprietary connector. We happened to have a PCIe carrier board with an Apple compatible proprietary connector. So we mounted the 1TB Aura Pro X and installed it in the OWC Mercury Helios 3 Thunderbolt 3 PCIe expansion chassis. If you use the Aura Pro X to upgrade your 2013 Mac Pro's storage, you could always use the 'old' Apple compatible flash blade with the Mercury Helios 3 setup. In this application, the Aura Pro X exhibited a slight drop in transfer speed during our 10 minute thermal throttling test. Sequential READ dropped to 1167MB/s and sequential WRITE dropped to 792MB/s. Rather than thermal throttling, the drop in speed had to do with the SLC mode buffer overflowing and starting to write in MLC mode. Normally it has time to do housekeeping and you don�t see this slowdown. Order in capacities from 1TB to 8TB direct from Other World Computing (MacSales.com) or from B&H Photo Video. Order in capacities up to 2TB direct from Other World Computing (MacSales.com) or from B&H Photo Video. Other World Computing has the Mercury Helios 3 Thunderbolt 3 PCIe Expansion Chassis. You also can order it from B&H Photo Video. 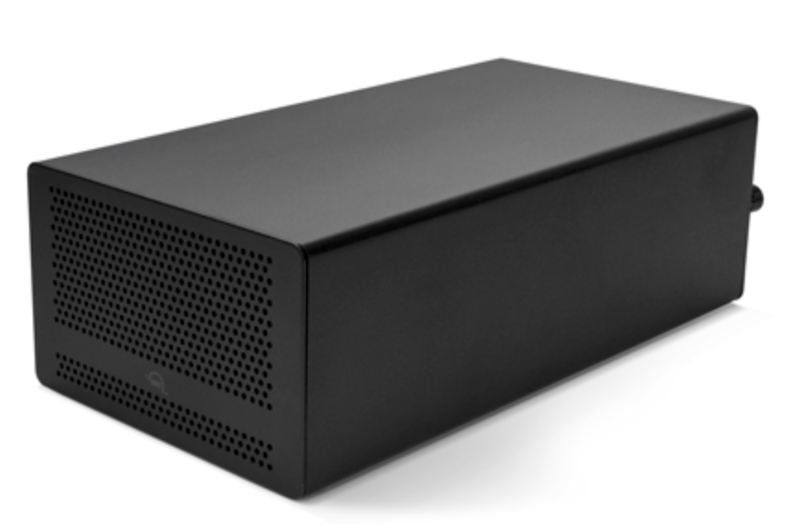 AKiTiO has the Node Lite Thunderbolt 3 expander box that is fully compatible with Mac. Order direct from AKiTiO or from B&H Photo Video.